Do most of your online purchases come from the UK? Are you aware that when the UK leaves the EU, current rules around online shopping may no longer apply? These are the questions for Irish people who purchase goods from UK businesses. There's no doubt, Irish consumers love shopping online. In 2018, there was a 40% rise in online shopping when we spent €5 billion. €3 billion of those purchases were outside of Ireland. Christmas alone saw a 60% increase in shopping online, compared to 2017. When purchases are made from businesses in the EU, customers hold strong consumer rights under EU consumer protection legislation and the Consumer Rights Directive - including the chance to cancel an order within 14 days of delivery. However, when the UK leaves the EU, in the absence of EU consumer protection law, it will become more important for consumers to know the geographical location of the company they are buying from. The Director of Communications and Policy with the Competition and Consumer Protection Commission says a domain name on a website does not necessarily indicate where the company is based. Áine Carroll says it is important for people not to rely on .ie or .co.uk as evidence of where a company is based. "You need to look at the company website at where it's geographically located. So if it's outside the EU it's really important to read the terms and conditions on the website - particularly what will happen if you return the items you bought", she advises. So what happens if just over a week to Brexit you buy online from a UK website and want to return it? That's unclear, according to Áine Carroll. People buying items on UK websites are asked to check with the company whether it's an item that may be returned and for them to be aware of their rights. "A lot of UK companies are currently opening up websites in other member states to ensure they maintain rights under European Protection law", according to Áine Carroll. While some companies are starting to enshrine aspects of the law in their terms and conditions, consumers can not rely on those terms and conditions, because they are not a legal right. 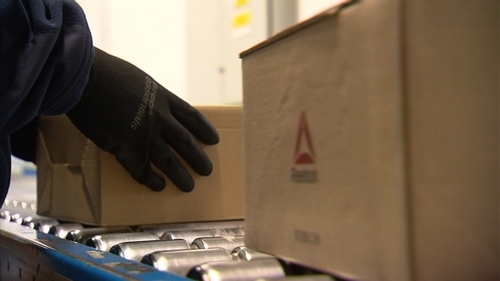 Once a purchase has been made online from a UK website, the item will arrive into An Post's depots where it will be treated as "third country" goods. While there is little An Post can do at the country's ports, its managing director Gareth Bridgeman says the company has worked closely with Royal Mail and Amazon to ensure there are no delays for Irish customers, once goods enter the depots. "If you buy something online from the UK it will be same as buying from United States", he says. "The item will be presented to Customs and post personnel will collect the fee at the front door. We deal with over 10 million items a year from outside the EU and our postmen and women collect charges, but now, on a bigger scale". Revenue, which has always maintained a customs presence in An Post's central delivery office in Portlaoise, will increase its number of personnel to deal with third country parcels from the UK. In Revenue, Maureen Dalton has responsibility for mail centres. She says while the volume of large parcels going through Portlaoise mail centre is expected to grow, Revenue will "respond accordingly". Judging by last year's online shopping habits, little will deter Irish consumers from shopping online.